G106 – Background screens should not be pure white or change rapidly in brightness between screens. Background screens should not be pure white or change rapidly in brightness between screens. Aging process brings some visual impairments. Reading text on a computer can represent an difficult task. The older users not only have difficult to read characters too small but also standard white screen can hamper this task. Older adults also adapt more slowly to changes in illumination, so the rapidly changes in brightness between screens should be avoided. Some examples of colors combination to avoid, and a good example of colors combination. Colors, Content, Elderly, Graphics, Layout, Screen. G105 – Blue and yellow or red and green tones should be avoided. Warm colors are the most suitable. Blue and yellow or red and green tones should be avoided. Warm colors are the most suitable. Blue and yellow combinations should be avoided, given that many users (including the older adults and young’s) can suffer from tritanopia i.e. a visual defect that causes inability to discern blue and yellow. Green and Red combination should also be avoided, once that many users can suffer from protanopia and deuteranopia, i.e. a visual defect that causes inability to perception of red and confusion of red with green. Excluding the aspects mentioned before, the use of colors with long-wavelength end of spectrum (i.e. “warm” colors) are most perceptible than the use of short-wavelenghts (“cool” colors). Visible spectrum of users with protanopia, tritanopia and identification of “warm” and “cold” colors. Colors, Content, Elderly, Graphics, Layout, Vision. G91 – Use colors with a good contrast. Colors should be used conservatively. Use colors with a good contrast. Colors should be used conservatively. A good contrast of colors used in a user interface is crucial for a correct viewing by older adults, in particular older adults with visual acuity limitations. So in the user interface should be used a sufficient degree of contrast between the background and the foreground. One way to achieve this goal is using highly contrasting colors schemes, such as negative (light text on dark background) or positive (dark text on light background) polarities. Both polarities have similar levels of readability, but it has been noticed that negative polarity is slightly easier to read on the screen. An example of an application using a negative high contrast color scheme. Colors, Content, Elderly, Graphics, Layout. G73 – Use high contrast between the elements of the user interface. A high contrast between the foreground and background should exist. Use high contrast between the elements of the user interface. A high contrast between the foreground and background should exist. The choice of a good contrast of colors influences the viewing of the user interface, in particular by older adults having visual acuity limitations. So, to face these limitations , in the user interface should exist a high contrast between the background and the foreground. 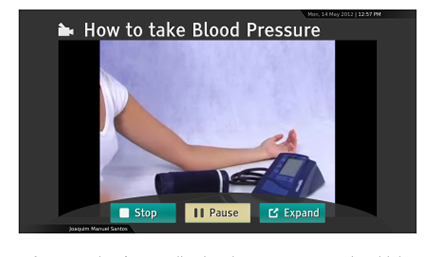 An example of an application that providing a higher contrast between the button color (light green) and the background color. G71 – Do not use blinking elements or other elements that capture attention. Graphics should be relevant and not for decoration. Minimal to no animation should be present. Do not use blinking elements or other elements that capture attention. Graphics should be relevant and not for decoration. Minimal to no animation should be present. The use of blinking elements should be avoided because these elements capture attention of older adults. Additionally other animated or irrelevant graphics, information and elements that may distracting an older adult should be also avoid. An example of blinking element that should be avoid. Animation , Elderly, Graphics, Layout. G68 – Use icons along with labels. Icons should be simple and meaningful; text incorporated with the icon when possible. Use icons along with labels. Icons should be simple and meaningful; text incorporated with the icon when possible. 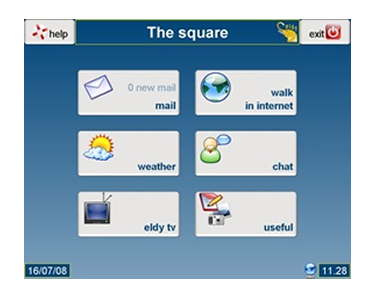 The use of symbolic icons helps in the use of applications by older adults, essentially the older adults that present problems in reading. For better design it is recommended the use of simple and meaningful icons, followed by some text whenever possible. An example of an application with labels and icons in hte buttons. Accessibility,Content, Elderly, Graphics, Icons, Layout.